Preheat oven to 350°F. In medium saucepan, bring 1 ½ cups of water to a boil; stir in Royal blend, reduce heat and cover, let simmer for 15 minutes. Meanwhile, remove stems from mushrooms and place caps on rimmed baking sheet and set aside. Heat a skillet over medium-high heat. Cook and stir sausage and onion until sausage is browned and cooked through, 4 to 6 minutes. Drain and discard grease; return sausage mixture to skillet. Stir in cooked rice, panko, Parmesan cheese, garlic, and thyme into sausage mixture. Season with salt and pepper to taste. Stuff mushroom caps with sausage mixture and place back on baking sheet. 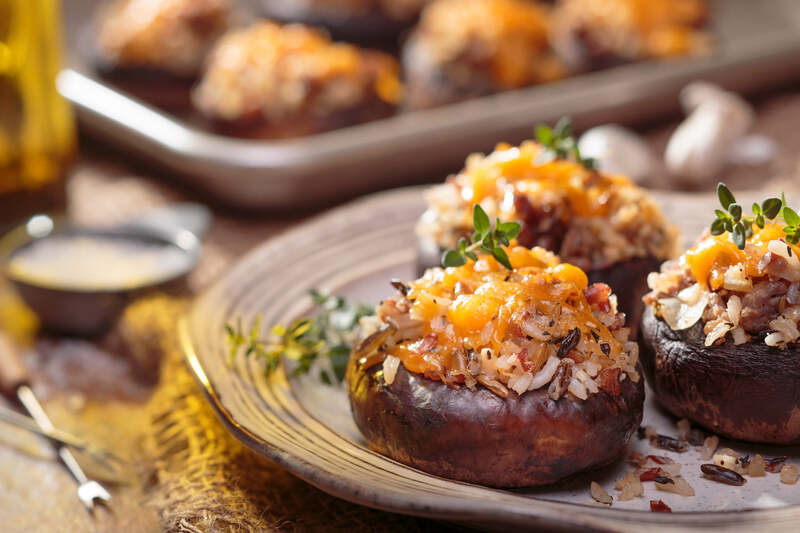 Bake stuffed mushrooms in the preheated oven for 10-12 minutes. Sprinkle remaining Cheddar cheese over mushrooms and bake until cheese is melted and bubbly, about 3 minutes..